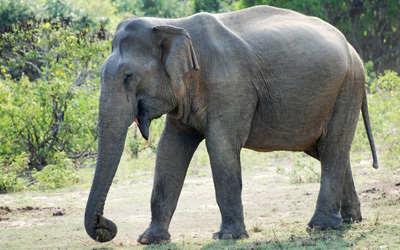 The national park of Yala which is considered as the second largest on the Island is in close proximity to the city of Hambantota. For those of you who are nature and wildlife lovers get the opportunity to indulge yourself with the most endemic wild animals, birds, various kinds of reptiles, flora and fauna. The park was proclaimed initially under the forest ordinance in 1900 and possessed around 389 square kilometers. The park receives rain only during the north monsoon season and spends the rest of the climate in dry semi-arid climate throughout the year. The park which spreads among five blocks were designated in the following years. As a matter of the lowest pen plain of Sri Lanka that holds Yala possess a reddish brown soil and a grey soil as prominent soils among the six types of soil in the park. An annual rain fall of between 500 to 775 mm is expected during the month of April. The wind speed is around 15 km per hour during the northeast monsoon and is likely to experience windier days in Yala mostly. Prepare yourself to experience an exciting and amazing wild life tour. Nature lovers couldn’t have a better opportunity to enjoy the sightings of the Yala national park elsewhere. The variety of ecosystems in the park that blends in moist monsoon, dry monsoon and deciduous monsoon with grasslands, fresh and marine waters with sandy beaches creates the best homeland for many wild creatures. The park has been home to many mammals as Wild elephants, Leopards, Slender Loris, Sloth Bear, Wild Water Buffalo, Golden Palm Civet, Fishing Cat and Toque Macaque. Various bird species in the sightings of the park include, Grey Hornbill, Junglefowl, Wood Pigeon, Black and Capped Bulbuls, Asian Open Bill, Painted Stork and White Winged Terns. There are over 215 bird species in the park. The records of the park indicate around 46 species of reptiles as Sri Lankan Krait, Sri Lankan Flying Snake, Loggerhead Sea Turtle, Mugger and Salt Water Crocodiles, Indian Cobra and Russel’s Viper. Some other interesting species in the park include, Blue Bottle, Lime Butterfly, Mormon and Crimson Jezebel. As you plan your trip with us, let us worry about the rest of your vacation. Our expertise in the field has been our greatest strength throughout. We offer all our clients with the best accommodation. On your request hotel accommodation outside of the Yala National Park could be arranged or can opt to enjoy safari camps within the park itself. The campsite accommodation is equally comfortable and beyond levels of satisfaction. Enjoy wild life jeep safaris as never before and capture moments that last long in your heart leaving your footprints with us with a heart to return.